The largest tropical island of China. Perfect for those who love palmtrees, beaches and the blue ocean. There are a lot of luxurious resorts down there but we would recommend skip them and enjoy the real island. Barbeque at the Chinese beach, grab a bike or a scooter and discover this Chinese island. Clarity Bay – Tianya – Right in front of our hostel. 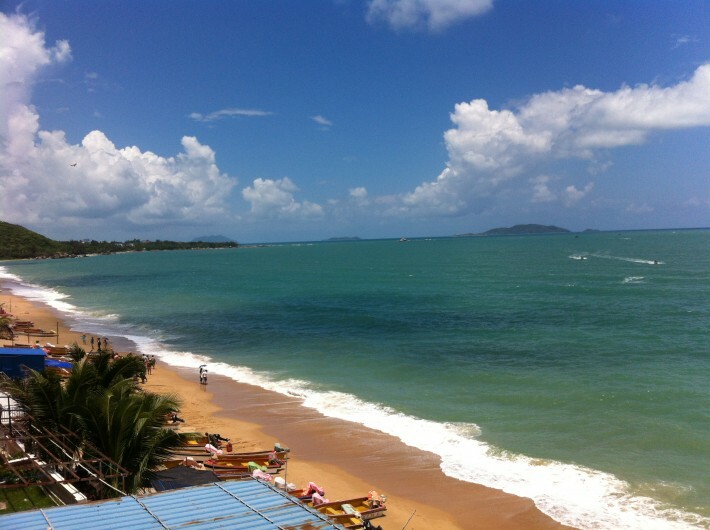 China’s largest tropical island is called Hainan. It is located to the south of China in the South Chinese sea. 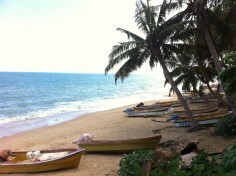 The island has a beautiful scenery, with gold-sand beaches, palmtrees and coconuts. Haikou is the biggest city at the tropical island of China and is located on the North side. 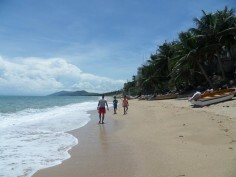 Sanya is the second largest city and known as most touristic. 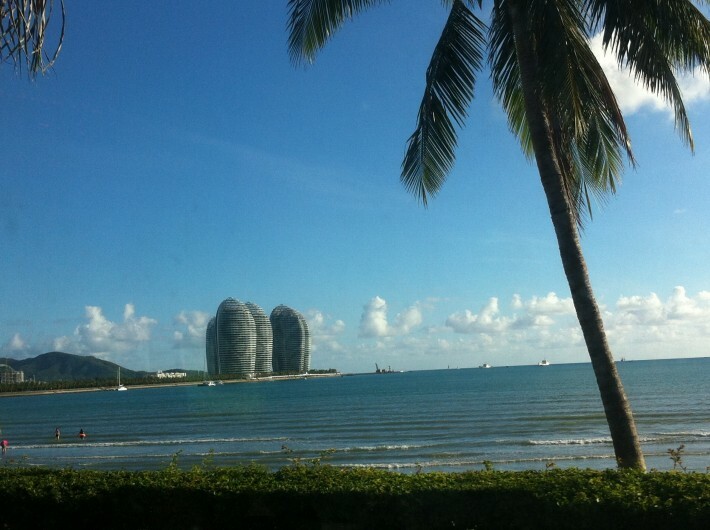 Most tourists go to Sanya to enjoy the luxurious hotels and resorts. There has been pumped a lot of money in the island to pump up the luxurious environment. Those resorts are popular amongst Russian tourists. We enjoyed the luxury for one day in Banyan Tree resort and we have to admit that it is extremely relaxed ofcourse. But we rather love to see the real island instead of those luxurious buildings which can be build almost anywhere. By airplane fly to Sanya Phoenix Airport or eventually Haikou Meilan Airport. Train, there is a connection with China mainland by train. From Guangzhou (China mainland) to Haikou takes around 12 hours, twice a day, hardsleeper: 197 RMB, softsleeper: 298 RMB. 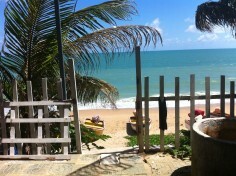 Then take the train or bus from Haikou to Sanya. For more information about trains in China see this page. Bus: take a bus from the China’s mainland to the island. Guangzhou to Haikou is 280 RMB, 10 hours. After that take the bus from Haikou to Sanya which is 75 RMB for 3,5 hours. We arrived around 12 o’clock midnight at Sanya Phoenix International airport, we booked the ‘Sanya Clarity Bay Hostel’ in Tianya which was difficult to find for our cab driver in the middle of the night. In a complete dark village we found our cheap hostel (40RMB / €3,80 a night) next to the beach. Our dorm consists out of two bunkbeds and a bathroom, the matresses were made of palmtrees and were quite hard but we all slept perfect on it. Although the hostel wasn’t a typical youth hostel, it was cheap and clean, perfect for us. – Dorm price per night: 40 RMB / €3,80 a night in July 2014. Waking up while smelling and hearing the sea is good. 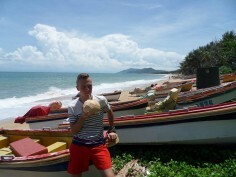 Walk out of the hostel into Tianya village and buy a coconut (6 RMB / €0,40) to drink the milk and wake up is even better. For those who are not used to it, we couldn’t find a ‘Western’ breakfast but we were fine to eat noodles or egg friedrice for breakfast. 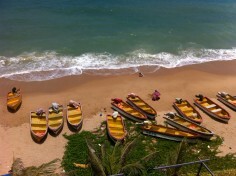 I walked with my coconut down to the Chinese beach to see all those small boats and palmtrees along the beach, perfect. In the night we discovered that a shaokao restaurant (Chinese barbecue) was right at the beach of our hostel. A restaurant is maybe not the right word, but there was a cook behind the barbecue, chairs and some tables. We ordered some delicious fishes and vegetables by pointing at it, which were catched that day, fresher can’t it be. Together with a beer we had a perfect meal for about 35 RMB (€3,30) per person. We rented a scooter at our hostel, and an electric scooter in the village for the price of 10 RMB / €8 a day. And drove our way to the south-west coast. It is a great way to wander around the largest tropical island of China. 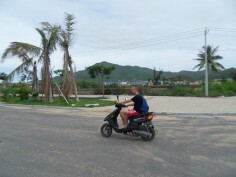 The atmosphere at Sanya is really layed-back, stop with your scooter in any random village to have a drink or plunge into the sea, don’t forget to enjoy the scenery while hopping from one to another village. A Chinese driving license was not needed.